As prisoners imagine life on the outside, can technology help them stay out? SEWARD — Prisoner Anthony Garcia wants to meditate on top of the Sphinx. Prisoner Michael Lawson pictures a beach under the warm sun. Prisoner Lamont Moore imagines a virtual visit with family. "You could all be having dinner," he said. 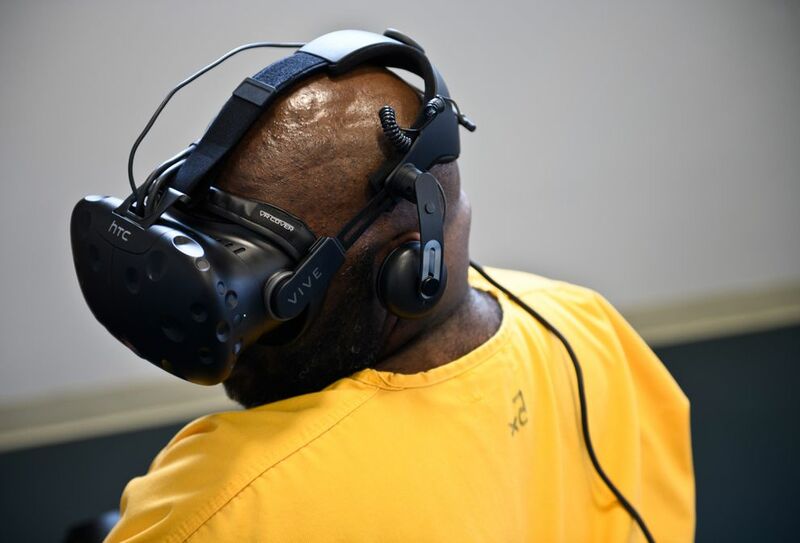 Perhaps there's no better group to dream of virtual reality possibilities than men who haven't been outside the walls of a maximum security prison in years, even decades. In the visiting room of Spring Creek Correctional Center, some had the chance to try it earlier this month. The Alaska Department of Corrections is exploring innovative recidivism reduction ideas statewide with help from a federal grant, officials said. Prisoners and staff both said virtual reality could be a valuable tool to enhance life skills and provide training to prisoners before they are released. "I see a tremendous upside," said prisoner Delano Hall. Spring Creek is the only maximum security prison in Alaska. It holds about 400 prisoners, some of whom have been convicted of the most serious offenses the state can charge. Several of the prisoners who participated in the test have been convicted of murder. "We have a 66.41 percent recidivism rate currently," said Morgen Jaco, the re-entry program manager for Corrections, referring to felony offenders who return to prison within three years of release. "It's just not good enough," she said. Representatives from the National Mental Health Innovation Center, based at the University of Colorado, think they can help. 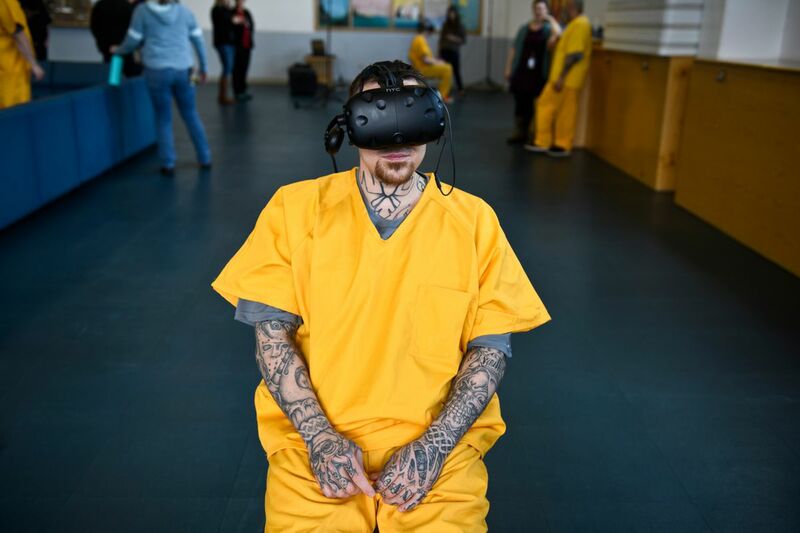 Virtual reality can be an effective tool for prison reform in the same way it has worked in other mental health applications, according to executive director Matt Vogl. "We know for a fact, because it's been studied, that it can help people with PTSD, and depression, anxiety and all kinds of social phobias," Vogl said. "It has the ability to build empathy for other groups of people and populations better than any other tool we've had." The National Mental Health Innovation Center is working with New York City-based software developer Nsena Virtual Training. Vogl said the center acts as an intermediary, helping inform the content for the developer while demonstrating its potential to prisoners and staff. Virtual reality is an emerging technology in which users are immersed in a computer-generated simulation. "VR is one of those things. Until you have tried it, you have no idea," Vogl said. Prisoners strapped on goggles, held controllers in each hand, and experienced scenarios designed to impress, soothe, and even trigger anger. The first stop was Richie's Plank Experience, a virtual reality app from the Steam online video game store, a good tool to show the power of VR, said Nsena CEO Ethan Moeller. After viewing a nameless downtown from the street level, the user enters an elevator that carried them high into a skyscraper. When the elevator opens, an iron beam was the only walkway forward, with nothing between it and the busy street far below. It was convincing enough that some chose to stay inside. Prisoner Jason Downard fell from the beam and shared colorful language on his digital descent. "You could hear the wind going by your ears," he said. 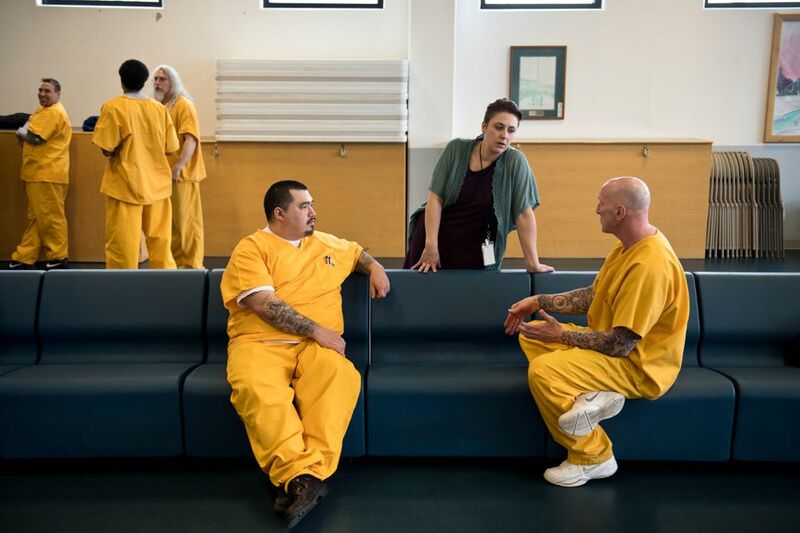 At a second station, prisoners walked into a make-believe job interview. A ringing phone interrupted the conversation with a surly-looking potential employer, who folded his arms and fired hard questions at the candidates. "What value do you bring to this company?" the animated character said. "That's a really hard question for someone who just got released from decades in prison," Vogl said. Kent Matte, an inmate who hopes to be released next year, said it was valuable practice in a low-stakes setting. Out in the world, workplace failures can send people back down a path toward drugs and alcohol. He knows that's a precursor to a return to prison. "I did that," he said. Vogl said Colorado's prisons are the only others they work with right now. Alaska prisons offer a unique opportunity due to geographic isolation and workforce shortages, he said. "If we can work with Alaska and solve some of those problems here, then we can solve them anywhere," he said. Inmates weren't the only target audience. Probation officer Josh Varvil tried a weapon-drawn training scenario, holding a controller extended like a pistol. By the time he took off the goggles, he said his heart rate increased. That's a reaction he said was stronger than role-playing scenarios he had been through, where the trainees usually knows the other actors. "I think the officers will get better training out of it," he said. Though impressed, some prisoners said the software wasn't flawless. Delano Hall said the lack of some small details prevented him from getting "lost inside of it." For example, the trees didn't look real enough, he said, and the cars seemed to be all the same make. Matte was distracted that the job interviewer didn't blink. Vogl acknowledged that the characters would need to look and sound more like Alaskans for it to be more effective here. "The details, if more polished, can be a spectacular experience," Hall said. He suggested a virtual scenario in which a user finds himself at the center of urban bustle and noise, an experience prisoners may have not experienced in many years. Bill Lapinskas, superintendent of Spring Creek, noted the prisoners' enthusiasm and said his own opinion mattered little. "What I do have is little respect for what what we've done for thirty years," Lapinskas said. "With a 67 percent recidivism rate, we're not fixing anything. So why not try anything?" 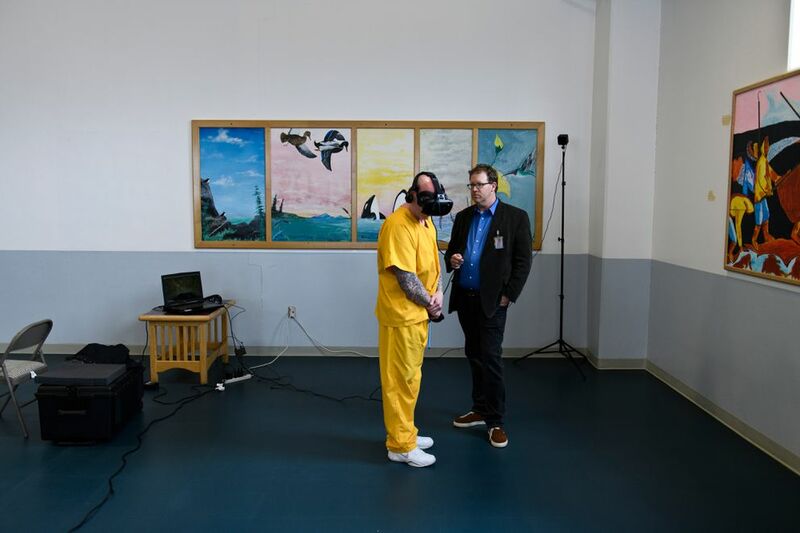 Brian Radel, who is 14 years into a 99-year sentence, offered his own idea about how virtual reality might be applied. "I'm in on murder. I killed one person, hurt a lot other people as a result. Emotionally. Mentally," Radel said. "And my goal is, if I can create less victims when people get out, then I can pay back to society a little bit of what I did." Maybe virtual reality can be designed to help prisoners understand their impact on victims, he suggested. "I believe that evoking empathy is very important in making sure that when somebody gets out, they understand the pain, they feel the pain, and then they don't want to hurt another person," he said.